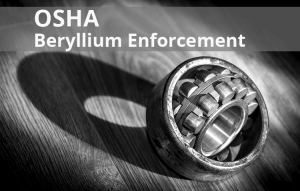 Now that the Beryllium Standard has been finalized, the Occupational Safety and Health Administration (OSHA) is beginning to enforce certain requirements of the new rule. The administration announced in a memorandum on May 11, 2018, that it would begin implementing the permissible exposure limits in general industry, construction, and shipyard standards. OSHA will also enforce the exposure assessment, respiratory protection, medical surveillance, and medical removal provisions in the general industry standard. Currently, the other ancillary provisions included in the standard for general industry will not be enforced until June 25, 2018. However, due to settlement agreements with the petitioners who have challenged the rule — OSHA plans to extend this compliance deadline until Dec. 12, 2018. The administration is still considering a proposal to remove the ancillary provisions of the rule for construction and maritime industries. Until it provides notice, OSHA will only enforce the permissible exposure limits for these industries. The rule outlined several other compliance dates that remain unchanged. The general industry requirements for changing rooms and showers will not begin until March 11, 2017. Requirements for engineering controls will begin on March 10, 2020. Is your jobsite in compliance for your next OSHA inspection? The best place to start is with a medical surveillance program. Not only can this help detect problem areas that need to be addressed — proper medical surveillance is also required under the new general industry provisions in the Beryllium rule. Be prepared for your next OSHA visit. Get in compliance with the new Beryllium Standard by scheduling a visit from a Worksite Medical. Call us today at 1-844-OCCUMED or visit us online to learn more. Working with Beryllium? We've got your back. Would you like a free silica medical testing guide? Would you like a free silica medical testing guide?Yes, email it to me.Yes, direct mail it to me.No, thanks. Just a quote. Will You Be Affected By The New Beryllium Rule?